The discovery phrase of a lawsuit includes most everything that occurs between the filing of the complaint and the final depositions. After the discovery phrase is completed, the parties generally reevaluate their positions and decide whether they should try to settle the matter. If the parties are unable to settle the lawsuit, they move to trial. If either of the parties believes that the trial judge made errors during the trial, they may choose to appeal the rulings. By the time discovery is completed, the parties should fully understand what evidence is going to be presented at trial. The defense attorney will generally prepare comprehensive reports to her client and, if applicable, her client's insurer detailing all the facts discovered during the suit. Sometimes new information will be uncovered during discovery that changes the way parties look at the case. For example, in a disputed red light case, it may initially appear that driver 1 ran a red light. However, if eyewitnesses testify otherwise, or if a city engineer gives testimony showing that driver 2 must have ran the light, the value of the case may change dramatically. Parties may be required, or may choose, to attend mediation, which is a settlement conference generally officiated by a legal professional such as a retired judge. Federal magistrate judges typically mediate federal cases. Many state and federal judges order the parties to attend mediation before setting a trial date to bring the parties together in the same room to try to resolve their differences. Mediation encourages direct communication between the parties, allows an emotional party to voice his frustrations, and can sometimes defuse hard feelings between the parties. Many cases settle at mediation, saving the parties from incurring more expenses for expert witnesses and trial preparation. If the parties cannot settle the lawsuit, they will move forward to trial. In a civil jury trial, the court first rules on motions made by the attorneys that could affect what evidence is allowed. Then, generally, the attorneys question prospective jurors to make sure that only fair and impartial jurors are seated on the jury. The party with the burden of proof gives the first opening statement, followed by the other party. The parties put on their witnesses and present their evidence through direct examination. The opposing attorney asks questions in cross-examination to expose weaknesses in the testimony. After both sides have presented their proof, the attorneys give closing arguments and the jurors are sent to deliberate. They return to court after making a decision. If one of the parties believes that the court erred in making a ruling, the party may choose to file an appeal. Many states allow an appeal as a matter of right, meaning that even if the basis of the appeal is weak, the party is allowed to proceed with the appeal. Appeals can last several years and typically involve purely legal decisions. 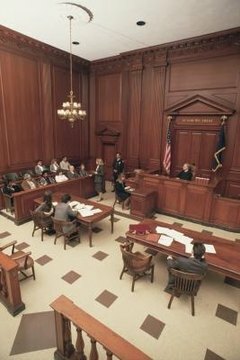 Although appeals courts are willing to reverse legal mistakes made by trial court judges, they generally do not make factual decisions, such as whether a witness was credible. A appeals court may uphold the trial court's ruling or reverse the trial court, asking the trial judge to reconsider the ruling, or even set the matter for a new trial. Martin, E.S.. "What Happens After the Discovery Phase in a Lawsuit?" , https://legalbeagle.com/12317581-happens-after-discovery-phase-lawsuit.html. Accessed 21 April 2019.